In memory of my father, Jesse Vaughn (1908â1994), the soul force in my life even when I didn't know it. For my grandson, Xye Allen Arellano, and his generation. R.L.A. Rhine River, the major natural barrier protecting Hitler and his weakened but still dangerous armies. It was a time of fierce battles at Forbach, Freimheim, and other German towns as Allied armies raced to the Rhine. For the first time black soldiers were playing a major combat role in the Allied campaign. Staff Sergeant Edward A. Carter Jr., my father-in-law, was one of the soldiers in the forefront of this fateful assault. Black American soldiers had not been welcomed into combat. For most of the war they were restricted to racially segregated units, working in service and support roles, such as truck drivers, stevedores, and engineers. But as a result of heavy casualties inflicted in the Battle of the Bulge, Supreme Allied Commander Dwight D. Eisenhower was compelled to find replacements wherever he could, and that included allowing black soldiers to volunteer for combat duty. This was the opportunity many black soldiers had hoped for. Thousands volunteered, and, after hasty combat training, more than 2,000 black soldiers were organized into black combat companies under white officers and attached to larger white units as part of the Rhineland campaign. These fresh reinforcements were critical to the campaign's ultimate success. But to ensure that no black soldier might command whites, black sergeants were required to relinquish their stripes. 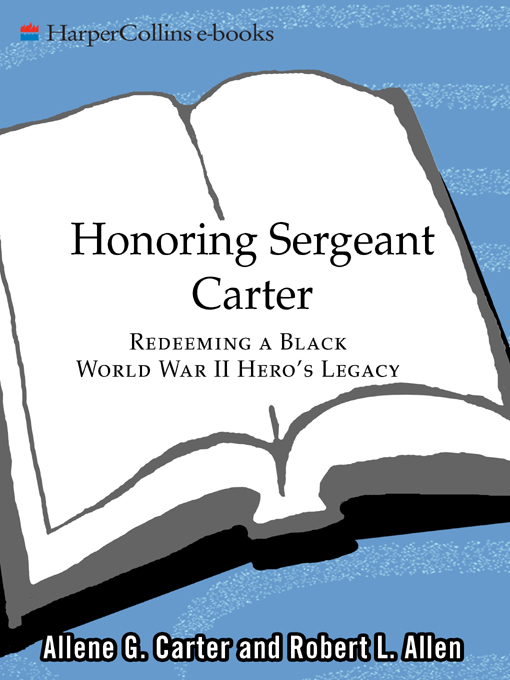 Sergeant Carter had enlisted in the Army from his home in Los Angeles in September 1941 and had risen to the rank of staff sergeant in an all-black truck company. Eager to get into the fight, he volunteered daily for combat duty, finally being accepted after the Battle of the Bulge, but at the cost of his sergeant's stripes. On the bright morning of March 23, 1945, Sergeant Carter and his black rifle squad were riding on a tank as members of the Fifty-sixth Armored Infantry Battalion with the Twelfth Armored Division in General George S. Patton's Third Army. They were advancing on Speyer, a town of 50,000 inhabitants on the Rhine. The night before, Patton's Fifth Infantry had ferried themselves in small boats across the Rhine near Oppenheim, allowing Patton to boast that he had beat British Field Marshal Bernard Montgomery in the race to be the first to cross the Rhine. Now the objective was to capture the bridge over the river at Speyer. machine gun and a clutch of hand grenades, twenty-eight-year-old Sergeant Carter stepped forward and offered to lead the way with his squad. Of medium height and lean, compact build, Eddie Carter was a handsome man with curly black hair, reddish-brown skin, and high cheekbones. His face was relatively thin, and its dominant feature, a square jaw, was often adorned with a thin mustache. He moved, some said, with the graceful agility of a panther. While the officers set up an observation post, Carter and his three men began to advance across the open field, not realizing that the tanks were not following. Scrambling to his feet with his tommy gun and his string of grenades, Carter charged the machine gun that had wounded him. Tossing a grenade into the German position he permanently silenced the gun. Running hard, he lobbed two more grenades, wiping out a German mortar crew that had been shelling the American lines. Still on his feet, Carter was hit by two more bullets and knocked into the air. Bullets cut into the dirt around him as he hit the ground and crawled behind a low embankment. As he tried to see where the fire was coming from, another bullet tore into his shoulder. Exhausted by his ordeal, Carter remained still. Time passed. His company officers, watching from their observation post, couldn't tell whether he was alive or dead. Germans emerge from the warehouse and move toward Carter's position. Suddenly Carter popped up and opened fire with his submachine gun. Using three clips of ammunition he brought down all but two of the Germans, who threw up their hands and surrendered. Now Sergeant Carter had a problem: What should he do with his prisoners? One was an officer, and the other an enlisted man. Carter, who could speak some German, realized that his prisoners might be able to provide useful information on German positions. In the meantime, they could help him escape. Keeping his prisoners as close to him as possible, Carter used them as shields as he struggled to make his way back to the American lines. The tactic seemed to work for a while, but then German artillery opened up on his position. Carter took cover with his prisoners behind a gutted building, but an 88mm shell exploded nearby, sending shrapnel into his legs. Fortunately, the dust thrown up by the shell-burst offered a temporary screen, obscuring his movements as he hobbled toward the American lines partly leaning on his prisoners. Three German infantrymen made a last-ditch effort to stop him, but he took them out with his trusted tommy gun. gathered about German gun positions. Under interrogation the prisoners also gave valuable information about German positions that greatly helped the advance into Speyer. The retreating Germans managed to destroy the bridge, but that did not stop the American assault. Engineers built a treadway bridge that allowed the U.S. forces to cross the Rhine. Virtually single-handedly, Sergeant Carter's heroic actions had defeated a determined German effort to halt the Twelfth Armored's advance in the Rhineland campaign. Sergeant Carter was eventually evacuated to an Army hospital to recover from his wounds. Within a month he slipped out of the hospital and made his way back to his company, where he remained as a combat soldier through the final weeks of the war, then returned home to his family in Los Angeles. Sergeant Carter was awarded the Purple Heart for his injuries, and for his heroism against the German troops he received the Distinguished Service Cross, the nation's second-highest award for valor in war. That he deserved the Medal of Honor, the nation's highest award for valor, eventually would be recognized, but not until long after his death. hat my husband's father was a war hero who played a pivotal role in the Rhineland campaign during World War II was never fully known to us until we got a call on May 2, 1996, a call that would change our lives. The caller, Gloria Long, asked to speak to Mildred Carter, Sergeant Carter's widow. For several years Mildred had lived with her son, my husband, and our family. She suffered from Alzheimer's disease. I explained to the caller that Mildred was not well, that I was her daughter-in-law, and that perhaps I could help her. Ms. Long said that she was a public relations liaison person with the Department of Veterans Affairs. She was calling to tell us that the White House was planning to award the Medal of Honor, the nation's highest award for valor in combat, to several African-American soldiers who served in World War II. One of the recipients was to be Sergeant EdwardA. Carter Jr.
in 1963, was a soldier in the war. I had heard a little about his wartime service from my husband, Edward (whom we all knew as “Buddha,” a nickname given to him by his father because he was so chubby as a baby), and other family members, but this award was completely unexpected. Ms. Long said that plans were being made to present the awards at a ceremony at the White House, although the date hadn't yet been set. Unfortunately, in 1973, a fire had destroyed the building in St. Louis that housed certain military records, including Sergeant Carter's. Could the family help in reconstructing his tour of duty in the Army? The White House was going to prepare press releases, there would be articles in the press, and they needed information and pictures. I was stunned. Yes, I managed to say, we would help. Mildred couldn't follow the details, but she understood enough to know that Eddie was going to be honored. “Finally. He deserves it,” she kept saying. “He deserves it. He deserves it.” William, Buddha's brother who lived in Washington state, was also excited, but his reaction was affected by a stroke from which he was recovering. Buddha, on the other hand, had always been withdrawn with regard to his father. Initially, I didn't get a big response from him. every other major American conflict, including the Civil War. Some 1.2 million black Americans served in the U.S. military during World War II, more than in any other war. A number of soldiers, including my father-in-law, won the Distinguished Service Cross, the second-highest award, but of the 294 Medals of Honor awarded, not one went to a black soldier. Some black veterans speculated that this was no accident. Pressured by the black press, civil rights groups, and veterans and their families, and facing the possibility of congressional action, the Army decided to look into the matter. formed leadership agreed with its recommendation and initiated corrective action. It was decided that six of the Distinguished Service Cross recipients and a winner of a Silver Star, the third-highest award for valor, would be awarded the Medal of Honor. There was only one snag: Congress would need to waive the 1952 statutory time limit on granting the award to World War II veterans. Congress was expected to vote on the issue in September and the ceremony would be held sometime after that. he spring of 1996 had been a deeply somber time for us. In March, Buddha's brother William suffered a stroke and was hospitalized, unable to speak. In the same week, Iris, Mildred's daughter by her first marriage, also had a stroke. It was a terrible double blow. Iris was on life support for a period of time, but her condition didn't improve, so we finally had to make the decision to discontinue life support. Understandably, Mildred was very upset by the death of her daughter and her son's illness. We were also worried about how William might take the news, so we made the arrangements for Iris's funeral and buried her without telling him. won a medal during the war. Mildred was also vague about Eddie's war experiences. Both of them seemed to feel that Eddie had been given a “bad time” by the Army, but I couldn't get details. I couldn't tell if they simply didn't remember or didn't want to say. published a long article on the government's plan to belatedly award the Medal of Honor to seven black veterans of World War II. The article was written by Joe Galloway and included brief descriptions of each of the seven candidates, only one of whom, First Lieutenant Vernon J. Baker, was still living. The others were Sergeant Edward Carter Jr., First Lieutenant John R. Fox, Private First Class Willy F. James Jr., Staff Sergeant Ruben Rivers, First Lieutenant Charles L. Thomas, and Private George Watson. The article included accounts of what each man had done to deserve the medal. Although brief, the description of Sergeant Carter's bravery was more than I knew before. I felt a surge of excitement as I finished the article. The reality of it all was beginning to sink in. assembling everybody in the same room with a tape recorder I could get the background information the Veterans Affairs office needed. We made the trip in July, but it was not much help after all. Redd and Buddha had been too young to remember anything about Eddie's military service. Neither did an old family friend, Gloria Arno, who was then living in Washington. She used to work with Mildred in Los Angeles but she didn't meet the family until after Eddie was out of the military. Each of them had fragments of memories, but they argued and contradicted each other and I couldn't be sure what to believe. Mil's memory was fading; she couldn't give me much. I began to feel that Mildred had somehow shielded the boys from something. It was when we returned to Los Angeles from this fruitless journey that I remembered Mildred's trunk. I force it open? Neither Buddha nor I wanted to violate Mildred's privacy, but we were in a quandary. Everyone agreed that Eddie deserved the Medal of Honor, and we wanted to do what we could to ensure that he got full credit for his heroism. When I pried the trunk open it was filled with dozens and dozens of lettersâmostly letters from Eddie to Mildred. They included love letters, letters about plans they were making, letters about his experiences at various military bases and in the war. It was hard to put the letters down; they told a beautiful story of the love between Eddie and Mildred. Here were things I had never heard talked about in the family. There were also many photographs of Eddie in uniform, sometimes singly, sometimes with other soldiers. The pictures showed him in various locales, most of which I couldn't identify. I found photos of Eddie and Mildred together and pictures of them with Buddha and Redd as children. There was also a collection of old newspaper clippings and articles. I was thoroughly entranced. That trunk was a treasure chest. So much material was crammed in the trunk that I decided to organize it chronologically so that I could identify and follow the sequence of Eddie's own account of his military experiences. I also wanted to reconstruct the rest of his story and find out why his success seemed clouded to his family. with both the Chinese Nationalist Army and the Spanish Loyalists. That he was recognized as a war hero when he returned from the service was quite evident: several articles published in the 1940s described his exploits in glowing terms. There were also some disturbing references. One undated article claimed that Eddie had been denied the right to reenlist, that he was barred by the Army in Fort Lewis, Washington. Apparently, the National Association for the Advancement of Colored People (NAACP) was urging the Army to allow him to reenlist. There was also a letter he wrote to Mildred in 1948 telling her not to worry about the CIC, that his record was clean and they had nothing to fear. I worried about what all this meant, especially when I learned that CIC had to do with the military Counterintelligence Corps. Was he under investigation? For what? Did it have something to do with his reenlistment problem? Whatever happened, could it reach through time and adversely affect his candidacy for the Medal of Honor? and Professor Gibran, one of the authors, called to ask if I could send him a photograph of Sergeant Carter to be used in the forthcoming book. We also talked briefly about their research in the National Archives and the Army personnel files that had been destroyed in the 1973 fire in St. Louis. It occurred to me that the National Archives might have more information on Eddie that would be useful in my research for Gloria Long and the White House, and helpful in putting my mind at ease. But a trip back east seemed a remote prospect. ). Lee's book contained a one-paragraph description of the action at Speyer and Sergeant Carter's role in it. The context of this account was a visit on April 19, 1945, to the Twelfth Armored Division by General Benjamin O. Davis, the top-ranking black officer in the Army. in Chicago and was able to get a copy of the January 1947 issue, which included an article about black soldiers who won medals for bravery. The article, “Where Are the Heroes?,” included two wonderful photographs of Eddie with Mildred and their young sons in Los Angeles after the war. ongress had voted to set aside the statute of limitations on awarding the Medals of Honor to the seven soldiers. The ceremony was set for January 13, 1997. Time was pressing. In September 1996, I made arrangements to fly back east to visit the National Archives at College Park, Maryland. needed to make sure that Mildred's and the rest of the family's needs were taken care; and, of course, there was the expense involved. I worked as a supervisor of the 911 emergency dispatch center in Los Angeles County. With enough advance notice I could get a colleague to cover for me or arrange some vacation time. With some preplanning and meals cooked in advance, the family could survive for a few days without me. My husband was supportive. He wasn't altogether sure why I needed to make this trip, but he knew I was doing it to help his father. We would somehow squeeze the money needed out of the budget.